ClubCoins Necesarios: 180 Please note that, for now, you cannot download content from our platform directly onto a mobile device (phone, iPod, iPad, tablets...). You need to download your items onto a PC or Mac, and then transfer them onto your device in the normal way. We are working on allowing direct downloads to mobile devices but this is not possible in the current version of the platform. Sorry about the inconvenience! 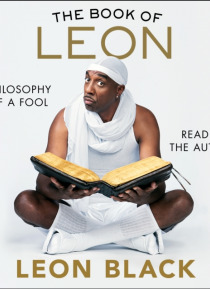 2018 Audie Award Finalist Everyone's favorite houseguest who never left, Leon Black (played by award-winning comedian JB Smoove on HBO's Curb Your Enthusiasm) drops his wisdom and good-bad advice for the masses. Learn the secrets Larry David has gleaned from the Falstaff of television. Live your best Leon. Bring the Ruckus.Aristotle. Gandhi. Lao Tzu. Dr. Ruth. Amateurs. For centuries bespeckled do… rks have pored over the scrolls of the ancients, read tea leaves, and looked to the stars for philosophy, wisdom, and advice. While some people have probably offered good advice, and others offer bad advice, Leon is here to offer his brand of good-bad advice. These are the musings of a master genius spitting out the secrets of the universeto help you become just like him. Be forewarned: in opening this tome and Leon's mind, you need be prepared for straight talk. The kind of unfiltered blunt straight talk that pounds on your door, invites itself in, makes itself at home, helps itself to your food, security pass code, your expensive organic beet juice, and finally makes itself comfortable on that twin bed in your guest room. All the while you think you're helping itbut really it's helping you help yourself! Because that's how this book doozit. Leon Black, he ain't wrong...he just ain't right.